If you want to go for an evening stroll in southern Arizona, you'll have plenty of company. Click here for more detailed pictures of your potential company. I really didn't go for a stroll, but I did want to see how my Sony 70-200mm F/2.8 lens works in near total darkness, so I decided to go out in the yard after dark and see what I could find as a subject. Luckily, I had a couple of easy targets. 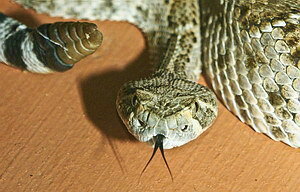 I used the Sony HVL-F56AM flash unit mounted, and off camera, to try and create the best lighting possible, especially for the Western Diamondback. This method is tricky, as the snake seemed to get riled up at the AF illuminator from the flash unit, not to mention when the flash itself fires!!! The snake was a good sport though, and never struck at me. He appears to be a youngin' judging by the number of rattles. I'd guess two years old. He's about 30" long (.8m). The Sony 70-200mm gets more impressive each time I use it. Spot focusing is dead-on, even with little light (porch light in this case), I aimed at the snakes head or eyes and pulled the trigger. This night I had the 1.4X TC on, but really didn't need it. 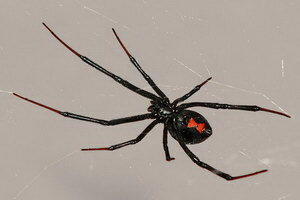 See 11 images of snakes, spiders and other more visually appealing subjects on the bounce! I've updated the "coming soon" page, deleting all the stuff that's done, and adding more new items like the Sony 28mm review and a new review of the cheapskates macro, the "49mm Hoya close -up set" retailing for about $25. Do these cheap little suckers work? Find out in a few days! The quick look Minolta AF teleconverter II APO page is up now. 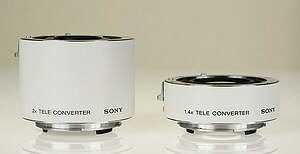 I just give the basics on the two teleconverters, not the full scale review like the sony TCs. If you're a Sony user and are thinking about an SSM lens, don't buy the Minolta teleconverters unless they are compatible, like the 8 pin (D) series which was the last of the Minolta AF teleconverters. The II APO won't auto focus on any Sony lenses. I also added some information that I forgot to put in the Sony TCs review, like multi-coating (predominately amber in color, the same as the Minoltas from 1988) and focusing speed and accuracy (basically the same with or without TC) with the TCs in place etc. I've completed the Sony 1.4X and 2.0X teleconverters review finally. It turned out differently than I would have guessed. I was shooting birds with the 70-200mm and 2.0X TC, when in fact I could've used the 1.4X and got the same results, read the review! I also have a bonus section at the bottom of the review page, where I compare the 70-200mm and 70-300mm lenses at different lengths. This section illustrates just how sharp the expensive 70-200mm F/2.8 is as compared to the 70-300mm F/4.5-5.6. I'm going to put up a short page on the Minolta APO II teleconverters so people will know the difference. Sharp-eyed visitors noticed my date slip on the last entry which read August instead of July. I was only busted by two people, which is a bit disturbing! Next up will probably be the stamp macro re-do, then some odds and ends pics. I'm going to do a Sony 28mm F/2.8 review soon too, it's basically the same as the Minolta but make sure to check it out as it will be the first of my all new lens review pages. Panasonic unleashes a few cameras today, and I like one of them, see below. The Panasonic Lumix DMC-FZ18 is being replaced by the FZ28 adding a 10mp sensor making the zoom range 27-486mm, plus a bigger LCD. 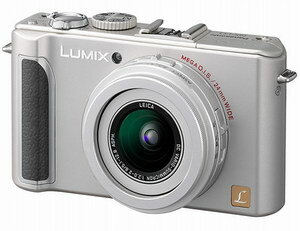 The Lumix DMC-FX100 is being replaced by the FX150, adding a few million more pixels (14.7) for good measure. 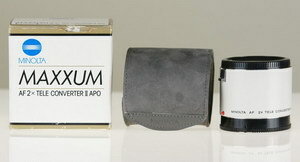 But the one I like is the Lumix DMC-LX3. It sports a fast F/2.0-2.8 lens that spans 24-60mm. That'll get you one to two stops faster and keep you out of the high ISO mess you get sometimes with the compacts. In the press release it looks like it has some sort of advanced manual focus option too, but we'll have to wait and see on that. It also has a nice and sharp LCD. This baby isn't cheap though, $500! Check out the specs below. 3.0" LCD with 460,000 pixels. Available (US) in Aug '08. I did a photo shoot in the local mountaintop community of Summerhaven this week, and took quite an assortment of lenses, then went on a nice hike. If Summerhaven sounds familiar, it's because it made world headlines in 2003 by being incinerated by a couple of hippie hikers tossing a cigarette along the trail. The whole town burned to the ground. The picture to the right is the new MT Lemmon Community Center, located on the main drag in Summerhaven. I have a boat-load of pictures, but I haven't had the time to go through them yet. If any of you are looking to buy a used Sony 300mm F/2.8, you can get a great bargain here. Adorama has this item, and it's been for sale quite a while. I think they originally offered it at $5299, but I'm not sure. It's now at $4999. That's a grand off the retail price. Also, I see Sony lenses have finally permeated the market enough so that used prices are starting to come down, things are settling down now and that's good. I have a lot of things planned for August, such as more lens reviews and a mild makeover of this site. It won't be anything crazy, just a different color or two and a new home page header picture, plus I may be going to the name kurtmunger.com instead of newcamerareview.com because I'm not reviewing very many cameras and it's a little misleading. As I said above, I'm going to review more lenses soon, but there'll be a little bonus. Many readers ask for comparisons of Sony to other lenses from different companies, such as Nikon and Canon, well folks, I'm going to give it to you! I'll start off with the kit lenses, from Sony, Nikon and Canon and how they compare, then work my way through all the lenses I can rent. It won't be cheap, so I'm going to have to put up a Paypal link (soon) to take some donations. Hopefully, if I've helped you save money or you just enjoy reading my reviews, you'll consider dropping me a few bucks. By golly I've finally found a useful breakfast cereal toy. To the left is the super secret Indiana Jones adventure spoon, collect all three! This little child choker has a red LED between the tip of the shaft and the base of the spoon and has a non-replaceable battery, which is too bad. Take the spoon section off and turn it into a very useful light for your nighttime outdoor photo sessions. It puts out just enough light for seeing your camera/whatever buttons or reading instructions. Look for this item in select Kellogg's cereal boxes. I got mine from Mini-Wheats. Other news items: I sent my Panasonic FX100 pocket camera to the factory for warranty repairs concerning dust on the back of the lens, and possible dirt on the sensor. Some people think you can't get dirt inside a fixed lens camera---but that's wrong. Go here for examples. I have several hundred miles of hiking with the camera in my front pants pocket, and the lens does extend out so there is an entry point for dust. Panasonic was pretty good about the repairs (no charge) and had it done in a week or so. I had to pay postage to their repair facility, and they paid for the return. That's fairly common though so no big deal. I think it cost $5 to send it. It looks like it's all nice and clean now. Also, check out the new State of Arizona 2008 Quarter. I posted a picture on the same page as the dirt on the sensor link. The design is nice, but maybe a bit too busy for the limited space. If you saw something on this page recently and it's gone, go to the Home Page Archives and look. I've sent the months of April and May there to lighten the load on the Home page. 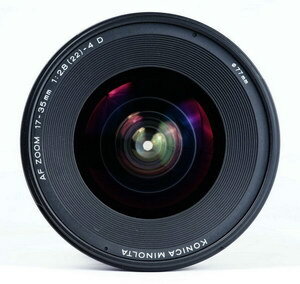 I've updated the Used lenses price guide. I'll be doing it about once a week instead of monthly. I hope everyone had a nice 4th. My favorite fireworks display didn't go off for some reason, so I didn't get to try out the new 70-300mm G at night. I have other plans for it though. I have the Konica Minolta AF 17-35mm F/2.8-4 (D) review ready for you, look at it during your mid-morning one hour break. It's a good lens, but not a real useful range on an APS-C camera. I think it'll be a bargain though on the upcoming full frame job. Speaking of secret Sony stuff, has anyone recently read the references to the "945" in relation to compatibility with DSLR items? Look on Sony's website and read pages from the bodies, lenses etc. I can't find the "945" reference to anything else. Now I can't find it at all. I saw it long before the full frame camera talk and "A900." 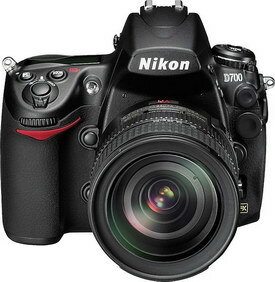 Nikon launches the new D700 FX camera secretly in the middle of the night here in the US. The chat room nerds must've stayed up all night just to get the first "official" look and specs. I simply went to bed. I guess it's the same as getting a sneak look at their Christmas presents the night before too. 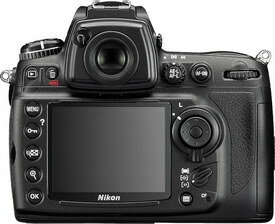 It looks like a pretty cool camera, though it'll set you back $2999, the D300 is half that. On store shelves by the end of July, they say. Also new is the Speedlight SB-900, and two new perspective control lenses, the PC E-micro Nikkor 45mm F/2.8D ED, and PC E-micro Nikkor 85mm F/2.8. Both have reproduction ratios at 1:2. 12.1mp full frame CMOS sensor. Sensor size 36mm x 23.9mm. 5fps shooting at full resolution, or 8fps with opt. battery pack. ISO 200-6400, 100, 12800, and 25600 in lo1 or hi1 and hi2 mode. Only one card slot, handles CompactFlash type I, II UDMA and microdrive. Quad-frequency, ultrasonic sensor cleaning gimmick. Two live-view modes, hand-held and tripod. Flash sync up to 1/250s. D-lighting, now with fancy new "auto mode." Battery, (same as D300), 1000 shots per charge (CIPA). Virtual horizon camera indicator, man, I could use this! 995g or 35oz without lens or battery. Self timer goes up to 20s. Body 5.8" X 4.8 X 3.0 or 147mm X 123mm X 77mm. Available (US) late July '08.